Early in 2017, HitRECord sent its first payments on the Hyperwallet platform. The company had spent years cutting and sending checks to users in-house, a process that was administratively cumbersome and financially costly, both for HitRECord and its payees. 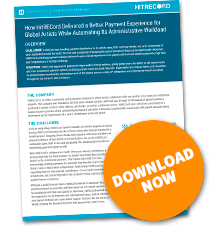 Tapping into Hyperwallet’s global payout platform, HitRECord was able to improve payment speed and choice, reduce fees, and automate the payout process through API integration. HitRECord is an online community and production company in which artists collaborate with one another on a variety of multimedia projects. The company was founded in 2010 by actor Joseph Gordon-Levitt and has, through its thousands of global members, produced a number of short films, albums, and books, as well as a television series. HitRECord users who have contributed to a project receive a portion of the profits if and when it becomes commercially successful, with payout amounts being determined by the significance of a user’s contribution to the end result. From an early stage, HitRECord opted to handle its member payouts in-house, issuing HitRECord-branded checks to those artists who had participated in a profitable project. Uniquely, these checks were popular with some members as physical evidence of their HitRECord contribution—but as the HitRECord community grew, both in size and geography, the administrative burden of distributing payments grew as well. HitRECord’s collaborative model insists that any user who contributes to a project—no matter how small that contribution—shares in the profits. That meant that HitRECord was increasingly sending payments for amounts less than the cost of issuing a check, many of which went undeposited. Additionally, HitRECord had an expanding base of international contributors. Cross-border check distribution proved slow, and converting USD to the recipient’s local currency added yet another barrier to delivery. With just a small treasury team, HitRECord wanted to automate the payout process as much as possible, and that meant an API-based solution that could tie seamlessly into their own platform. Moreover, HitRECord wanted to improve the experience for its domestic and international users, both by introducing new payout methods and value-added support features like tax services—and, ideally, keeping the branded elements that payees had come to love. Want to know exactly how Hyperwallet helped HitRECord reduce its administrative workload while delivering a superior payout experience to its artist community? You can download the complete HitRECord case study here.